Refresh the look and feel of any room in your home with vinyl flooring. In Sarasota, FL, our showroom features a wide selection of beautiful floors, including vinyl and hardwood floors. It’s easy to update one room or your entire home with our flooring options. In addition, we are proud of our experienced staff members that are ready to help with every step of your project. We even provide vinyl flooring installation to ensure exceptional results. You’ll find that we strive to be the top source for flooring throughout the area. That’s why we carry the best manufacturers in the industry. 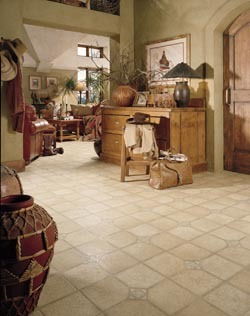 You’ll find the latest designs in vinyl tile flooring throughout our showroom. Stop by today, and we’ll help you choose the best floor based on your needs and price range. Due to modern manufacturing techniques, vinyl flooring comes in nearly limitless designs and patterns -- from basic to elegant. Whether you want vinyl tile, plank, or sheet flooring, you’ll be able to pick from any number of styles in our showroom. It’s easy to create a whole new look for your home. Vinyl gives you the flexibility to choose exactly the style you want. The vinyl floors at our store are made using advanced embossing. They actually mimic the look of real stone, tile, or slate. For a more elegant feel, our showroom has vinyl that looks like natural hardwood too. We have options that feature detailed grain lines and knots that look impressive in virtually any room. With vinyl, you can give a timeless look to your kitchen or bathrooms without the worry of potential water damage. After a long day at work, the last thing you want to do is to clean your floors. You need resilient flooring that is quick and easy to keep in pristine condition. Our vinyl sheet flooring creates a smooth and beautiful surface. Cleaning is as simple as a quick sweeping and mopping. It’s really that easy to keep your vinyl floors looking brand new. Skip the hassle and shop at our flooring store today. Because vinyl remains so flat and smooth over its life, it doesn’t absorb particles like dust and grime. These flooring products are also scratch resistant. At our showroom, we also provide vinyl flooring installation from trained professionals. Our team works quickly to place your new floor without missing a single detail. There’s never a misaligned piece or air bubbles after we finish. You can rest assured that your floor is in great hands when you rely on us. Contact us to learn more about our excellent selection of vinyl floors. We proudly serve clients throughout the Sarasota, Longboat Key, Siesta Key, St. Armand’s Key, and Lakewood Ranch, FL, as well as the surrounding communities.